We went to a local barbecue joint last week with our favorite dining-out partners. They're both Jewish but they don't keep a kosher kitchen. However, they explained early in our friendship that they do honor tradition by abstaining from pork. So we were taken aback when they each ordered a half-slab of baby back ribs. I wondered: What do they think they're eating? The husband must have sensed my curiosity as he eagerly chewed his way to the bone. "Some things are just so good, you have to make an exception," he said. As Christians, Armenians have no religious prohibition against pork, but it was off the menu for 600-or-so years under Muslim Turkish rule. So the first Armenian immigrants to America brought no pork recipes -- really, no familiarity at all with such All-American fare as ham or bacon, much less deep-fried pork rinds. Armenians, however, are fast learners. My mother recalled that her father, the Kharpertsi chef, always made pork chops for dinner on Fridays. I wondered if he was thumbing his nose at the Turks, or maybe just having a bit of fun with his Catholic neighbors, who were forbidden to eat meat on Fridays. Or maybe he just liked pork chops. Mom did, too -- and her favorite side dish with pork chops was leftover spaghetti. I can't explain it, but it's a combo that just works. Years later, I was astounded to discover that Robyn's father had a yen for the same pairing. It must be an Armenian thing, somehow. My own taste for pork chops has waned a bit through the years as pork has changed with the times. The new breeds are much leaner, which means they don't taste quite as irresistibly fatty and they don't cook up quite as tender (except for the tenderloin) unless you take the time to marinate and cook them slowly. Which makes them perfect for...kebab! Of course, the Armenians in Armenia discovered this a while back. Pork muzzled into the Armenian diet during the Soviet era, and now it's a staple. We've been told that pork is the default meat for khorovatz (Armenian for shish kebab, or roasted meat) sold by street vendors in Yerevan. I couldn't wait to try it. No really, I couldn't wait until we finally get to Armenia, so I made it myself. And it was great, if I do say so. I wouldn't compare it to lamb -- nothing compares to lamb -- but it's a completely different taste and texture that stands up very well on its own. Pork also lends itself very nicely to seasoning of all sorts. One other note about today's pork: It has nearly shed its reputation as a "dirty" meat. Farmers long ago stopped feeding pigs scraps and trash and now use proper grain feed. As a result, trichinosis has declined dramatically. This is encouraging some fancy-pants chefs to serve their pork pink. We say: No thanks! For safety, cooked pork should be white and the juices should run clear. The USDA recommends an internal temperature of 160 degrees. 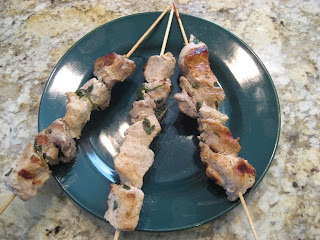 Here's our recipe for pork shish kebab. What's yours? Skewer the meat just before cooking. Brush with olive oil to keep the meat moist while grilling. Add salt to taste just before cooking. Serve with roasted red or green peppers, onions and tomatoes. And, of course, pilaf! Thank you for the explanation of why pork no longer gets my juices flowing the way it did when I was a child. I thought my memories of wonderfully tender, incredibly fatty pork might be just my imagination. Still like it, but it's not the same. You have to mention it is about Western Armenians because we Eastern Armenians were under Russian Christian rule and kept our pork tradition and didn't learn from others. It gives wrong understandig to foreigners. Pork is NOT an Armenian food! Armenians traditionally NEVER at pork. I urge you kindly to pick up some books written by Armenians about our ancient kitchens and foods and you will see, we NEVER at pork traditionally and most Armenians have a reversion to pork, Frankly only because of the Russian Empire then the Soviets did Armenians be forced to rely on the unclean and unfit animal which is a pig. I am sorry but again, I have to state, Armenians traditionally HATE PORK. Armenians do not hate pork. 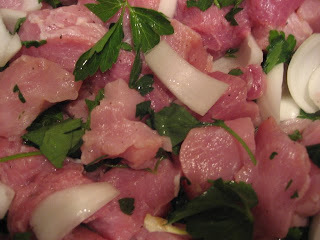 We always used pork in Armenian kitchen. The author explained all that in the article if you had bothered to read it. If you had to live among genocidal Muslims and Mohammedans you would not risk your family to be murdered or worse either. But once you were free from that constant threat, you might just try a ham or roast in the secrecy of your own home? I'll tell you one other thing, Armenians that I know are NEVER so rude as you come across in your comment. Therefore I suspect that you are not a true Armenian at all, but someone who only goes by an Armenian name. Any dry white wine will do nicely. Actually pork wasn't forbidden to Armenians. Turkish tribes themselves used it before and after their conversion to Islam because it was a normal food source and the wild swine was a revered animal (a remnant of the Sassanian culture). Also, those who payed the jizya (the tax that 'allowed' you to be another religion) were allowed to eat as they wished. The Turkic tribes were regional, (as were Armenians) it's more likely that domesticated pork production would not have been viable without a significant market (why bother when Beef and Lamb have more demand), and other pork (wild swine) was simply not available in many regions due to population pressures. Also, there are many of the diaspora that spent considerable time in Islamic countries before settling in the US, and much of those host cultures has been incorporated as 'Armenian' that really isn't. That being said, the Soviet Union brought back pork to the table, and today in Armenia, pork is the preferred meat for khorovats, and a mix of ground beef with some lamb for lule kabobs.